This month, ASME’s Journal of Mechanical Design published a technical paper I wrote as part of my mechanical engineering master’s research. This peer-reviewed paper is about error propagation through design models. The formula typically used to analytically propagate error is based on a first-order Taylor series expansion, and consequently, it can be wrong by one or more orders of magnitude for nonlinear systems. Using a higher-order Taylor series does improve the accuracy of the approximation, but this comes at higher and higher computational cost. This paper presents a technique for error propagation that achieves higher-order accuracy but without the additional higher-order cost. This is accomplished by predicting the Taylor series truncation error and applying a “correction factor” to the lower-order model. Abstract System modeling can help designers make and verify design decisions early in the design process if the model’s accuracy can be determined. The formula typically… more used to analytically propagate error is based on a first-order Taylor series expansion. Consequently, this formula can be wrong by one or more orders of magnitude for nonlinear systems. Clearly, adding higher-order terms increases the accuracy of the approximation but it also requires higher computational cost. This paper shows that truncation error can be reduced and accuracy increased without additional computational cost by applying a predictable correction factor to lower-order approximations. 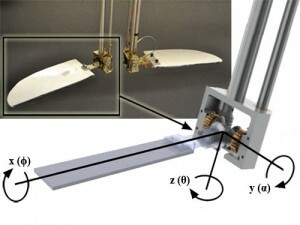 The efficiency of this method is demonstrated in the kinematic model of a flapping wing. While Taylor series error propagation is typically applicable only to closed-form equations, the procedure followed in this paper may be used with other types of models, provided that model outputs can be determined from model inputs, derivatives can be calculated, and truncation error is predictable.